Did a little tour of the area on a Saturday afternoon and as this bar was on BITE I sought it out. It was closed but looking through the windows it looks to have a bit of a minimalist theme. 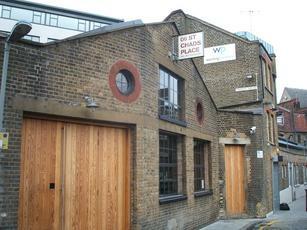 Looks like it�s in an old converted workshop and a bit out of keeping with it�s surroundings. However it�s in an area with a lot of development going on so I expect it will do reasonable business for a couple of years. To meet up with someone after work, this place is great- centrally located, spacious, easy to get what you want from the bar and not crowded. Tapas were an excellent choice, and happily fed two people. After 9 or so, though, when sort of irritating music starts blasting, it becomes hard to hear and chat, so time to move on! I don't know what the people below who didn't like the food are talking about - the lunchtime food in particular is amazing and one of my favourite places in London. Always fresh, creative and delicious. Evening tapas are less glamorous but the chips/mayo go down a treat with a glass of wine. St Chad's is still the best place in King's Cross. Amazing place in the middle of Kings Cross. A real gem!!! I couldn't believe something that stylish and cool exists in that area. Go here at least twice a week for lunch (which is delicious and always exciting as it changes every week) and usually I also end up coming here almost every Friday (or sometimes even Thursdays..eeek) for drinks with my girls. St Chad's is really what we needed here in Kings Cross and I can only tell ya: Give it a shot!!! Believe me, you'll LOVE it!! !